Chris Hemsworth has come up with a counter-offer to Dwayne Johnson’s crossover idea. Last week, Johnson joked that he wanted to have Hemsworth’s Thor character join him in the Fast and Furious franchise to meet the “real God of Thunder.” Social media exploded over the idea, even though it was clearly a joke. And now, Hemsworth has gotten in on the fun and taking it one step further with a hilarious meme that features both actors in a crossover that nobody ever saw coming. In Dwayne Johnson’s original tweet about the Thor crossover with the Fast and Furious franchise, he used a hashtag that reads: “Thor hits the floor,” leading many to believe that he was throwing some fun shade at Chris Hemsworth and the Marvel Cinematic Universe. Hemsworth then shot back with a photo of the two actors literally hitting the floor for a Dirty Dancing remake. Hemsworth photoshopped Johnson’s head on Jennifer Grey’s Baby character and then pasted his head on Patrick Swayze’s Johnny Castle character. You can read Hemsworth’s response below. Never one to be outdone, Dwayne Johnson responded to Chris Hemsworth’s hilarious idea. It seems that Johnson didn’t enjoy the fact that he’s wearing a pink dress in the Dirty Dancing remake idea. Johnson is obviously joking around and it’s cool to see the two action stars having some fun on social media together. Johnson had this to say. We’re definitely never going to see Thor crossover with the Fast and Furious franchise, which is probably for the better. 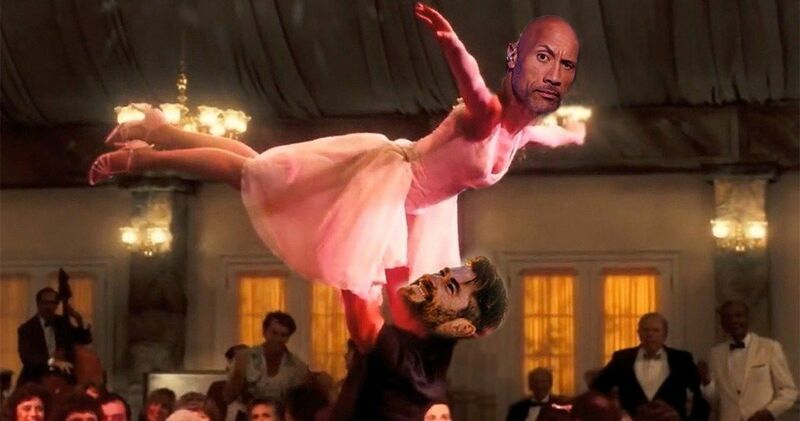 The same can be said about the Dirty Dancing remake, but one would argue that idea is much better than what Dwayne Johnson initially proposed. Chris Hemsworth and Johnson starring in Dirty Dancing could more than likely turn into some fast box office gold with their star power, but much like the crossover idea, it’s sadly not going to happen either, unless Funny or Die gets the two together for a sketch. Dwayne Johnson is hard at work as usual, preparing for the Hobbs & Shaw movie to hit theaters this summer while finding time to immerse himself in other projects that apparently do not require sleep. Chris Hemsworth is gearing up to start the promotional tour for Avengers: Endgame, which could be the last time that we see him on the big screen as the God of Thunder. While the Fast and Furious crossover with the MCU isn’t going to happen, hopefully we’ll get to see the two actors share the screen at some point down the line. You can check out the Dirty Dancing remake proposal below, provided by Chris Hemsworth’s Twitter account.